It’s a shocking news to the entire Telugu film industry that Movie Moghal Dr D Ramanaidu is no more. He is one of the key pillars on which the Telugu film industry was built. He was undergoing treatment for illness and breathed his last today(18/02/2015). It’s a heart breaking news for the film industry. He was the founder of Suresh Productions and hold the Guinness Book Of World Records for the most films produced by an individual. He has produced more than 150 films in 13 languages. In 2012, Dr D Ramanaidu was conferred with the highest civilian award in the Republic of India, the Padma Bhushan. He was born on 6th June 1936 in Karamchedu, Prakasam district in Andhra Pradesh. 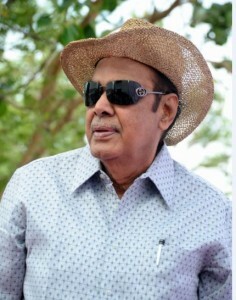 Ramanaidu is the father to Suresh Babu and Victory Venkatesh. May his soul rest in peace.